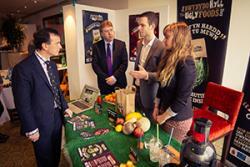 During the Conference, Alun Cairns MP had opportunity to hear about the Ugly Foods project- a student-run shop which sells supermarket reject fruit and vegetables.Today, a series of major economic announcements was made by Alun Cairns MP, Parliamentary Under-Secretary for Wales who delivered the Keynote Address at "Procurement Week", the major annual procurement conference organised in Cardiff by Bangor University's Institute for Competition & Procurement Studies (ICPS, Bangor Law School). The Minister revealed that the UK Government is on course to exceed its target to award 25% of UK Central Government spend to UK SMEs by the end of this year. Referring to initiatives spearheaded by Cabinet Office Minister, Francis Maude MP, the Minister revealed that out of £50 billion annual spend on goods and services, the UK Government will this year spend over £11 billion via contracts awarded either directly or indirectly to SMEs. This is a major development and follows hot on the heels of other key procurement enhancement initiatives to help SMEs win more public contracts. This follows other initiatives outlined by the Minister including the Mystery Shopper scheme, which aims to identify poor public procurement practices; the abolition of Pre-Qualification questionnaires for all low value contracts, allied to the advertising of all contracts over £10,000 in value. All of these initiatives are aimed at increasing participation by smaller business in winning public business. These initiatives have been welcomed by ICPS, which has over several years arising from its research, recommended that steps such as the forgoing need to be taken in order to bring more transparency to public procurement markets, and thereby give smaller businesses a fairer chance of winning public contracts. Welcoming the Minister's announcements, Professor Dermot Cahill, Bangor's Chair in Commercial Law urged the Minister to be even more ambitious should the Government be returned to power, and to take inspiration from Bangor's University's ICPS work which has helped public authorities in Wales reduce the time taken to award public contracts to as low as 40 days. This goes further than the UK Government recommended time of 120 days. The Minister also made other major announcements, confirming that the construction of Wrexham £212 million prison is employing over 75% of workers involved in the prison construction phase from the prison's hinterland, confirming that the constructor, LendLease has made a determined effort to leave a permanent economic imprint in the area, following the award of the prison construction contract. Finally the Minister also confirmed that the Government is determined to ensure that late payment rules are rigorously enforced in cases where the public sector is late paying SMEs for goods and services. Procurement Week continues tomorrow (Wednesday) with its Smart Cities theme, and on Thursday will look at new developments in European Procurement Law. It concludes on Friday, looking at new priorities in public procurement and SME access. The Week concludes on Friday Night at City Hall with the National Procurement Awards, compered by Lucy Owen, BBC.